Home Client Side Object Model (CSOM) Folder PowerShell SharePoint Online How to Download a Folder from SharePoint Online using PowerShell? How to Download a Folder from SharePoint Online using PowerShell? 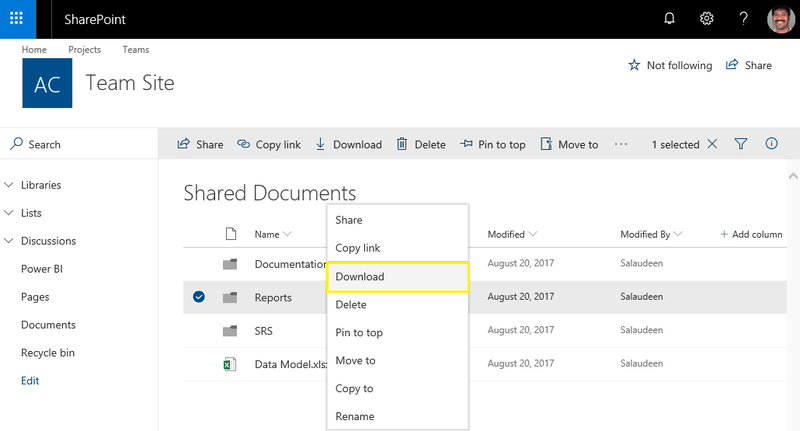 How to Download a Folder from SharePoint Online? Login to your SharePoint Online Site, Navigate to the Folder you want to download. Right click on the Folder >> Choose "Download" from the context menu. You can also use the "Download" button from the toolbar. This brings you a Zip file with the Selected folder and its Sub-Folders and its files. Quite simple, huh? Lets see how to download a SharePoint Online folder using PowerShell. Now, when we need to download a folder repeatedly, or automatically on a schedule basis, we can utilize PowerShell. Here is my PowerShell to download a folder from SharePoint Online. $FolderName = ($SourceFolder.ServerRelativeURL) -replace "/","\"